That's a beautiful piece Tammie :) I am making great efforts to find balance in my life this year! Your gentle bear looks very peaceful browsing in the morning among the pretty flowers. The yellow sky over the colourful hills looks peaceful too. What a lovely painting this is. Stop over from Lissa and bears are very much balance diet. seeing your bear artwork somehow always makes me think of something good, and strangely, calming. I guess we are like bears in some way, I certainly like to hibernate in winter. Dear Tammie, I like this peaceful painting VERY much! 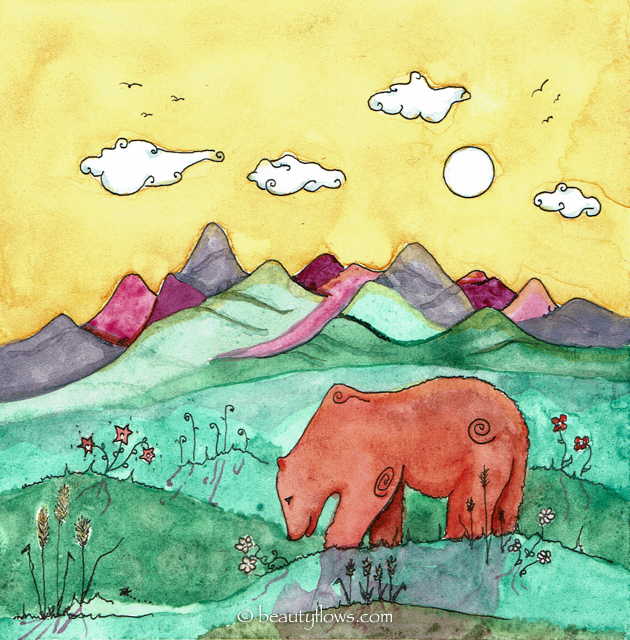 The sensitive bear, searching softly for flowers, is for me a symbol of the sensitive nature, which is always in balance, and we can learn so much! Only an artist, who knows he way to find balance is able to draw such a speaking friendly and peaceful scene. I love the thought of a life in balance. I know mine is far more so now than ever before. This says so much. You are blessed to live so close to nature. And to express it so charmingly through your art. Truly beautiful in so many ways, I love your gorgeous words, so inspiring and heartwarming...and your magical bear gently feasting on flowers is amazing! I love the backdrop of colors as well..all so soothing and also mesmerizing at the same time. Wishing you a magical February and Feast of Brighid.